It's hard to believe that Richie Cunningham's kid sister is almost 51 years old, but it's true. Erin Moran, who was cast as Joanie Cunningham on Happy Days in 1974, was born in Burbank, California on October 18, 1960. Erin, the second youngest of six siblings, was just 14 when Happy Days catapulted her to stardom. Scott Vincent James Baio was born in Brooklyn, New York on September 22, 1961, the son of Italian immigrants Rose and Mario Baio. Scott joined the cast of Happy Days in 1977 as Fonzie's young cousin Charles "Chachi" Arcola. Right from the beginning, Chachi had a crush on Richie's little sister although she was not initially attracted to him. With his mop of dark hair, his heavy Brooklyn accent and his coppery skin, Scott Baio soon became a fan favourite. In his heyday as a teen heartthrob, he received thousands of letters a week. His popularity was such that in 1982, he and Erin left Happy Days to star in their very own sitcom, Joanie Loves Chachi. In the Happy Days spin-off, Chachi moves from Milwaukee to Chicago with his mother, Louisa, and stepfather, Al. Al opens a restaurant where Chachi entertained with girlfriend Joanie who shared the vocals with him. Their backup band consisted of a weird drummer known as Bingo and Chachi's cousins Annette and Mario. 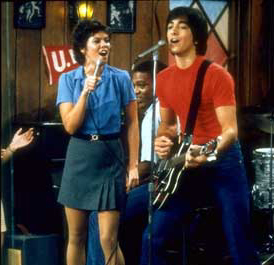 The series followed Joanie and Chachi's attempts to advance their music careers. Chachi's uncle, Rico Mastorelli (Art Metrano) was the band's manager. Bandmate Annette (Winifred Freedman) was Rico's daughter. Ellen Travolta, eldest sibling of actor John Travolta, portrayed Chachi's mother Louisa while Al Molinaro played the role of restaurant owner Al Delvecchio. By the way, Molinaro is now 92 years old. Joanie Loves Chachi aired for only two seasons. Despite Baio's status as a teen idol and high ratings , the show never really caught on with viewers. After the cancellation of Joanie Loves Chachi, Scott and Erin returned to Happy Days for its final season in 1984. In the last episode of the series, Joanie and Chachi were married. To watch a video of Scott Baio and Erin Moran singing "You Look at Me," the opening theme from Joanie Loves Chachi, click on the link below. After the demise of Happy Days, Scott Baio played the title character in another sitcom, Charles in Charge. Charles in Charge was the story of a college student (Baio) who found employment as a male domestic for a busy working couple. The show ran on the CBS network from 1984 until 1985. After being revamped, it returned as a syndicated series from 1987 until 1990. When Charles in Charge finished airing, Scott starred in a short-lived 1991series titled Baby Talk about a baby whose thoughts could be heard. Baby Talk was based the 1989 film Look Who's Talking with John Travolta and Kirstie Alley. In Baby Talk, Scott played a Manhattan apartment superintendent named James Halbrook. In 1993, Baio revitalized his career with a dramatic role in Diagnosis Murder (CBS, 1993-2001). Between 1993 and 1995, he played the part of Dr. Jack Stewart, chief resident at Community General Hospital in Los Angeles. Scott returned to the spotlight in 2007 with a realty series on VH1 titled Scott Baio is 45 ... and Single. Under the supervision of a life coach, Dr. Alison Arnold, Scott tried to come to terms with his relationship and commitment issues. During an eight-week period in which Dr. Alison advised him not to see his current girlfriend Renee Sloan, Baio visited some of his former girlfriends in an attempt to find answers. Erin Moran, whom Baio once dated briefly, appeared as a guest on the first episode of the series. In the series finale, Scott Baio proposed to Renee who then revealed her pregnancy. Scott later admitted that the couple had already married prior to the taping of the realty show. Their wedding took place on December 8, 2007 in a small rooftop ceremony at a luxury high rise in Los Angeles. They have a daughter, Bailey DeLuca Baio, born five weeks premature on November 2, 2007. Erin Moran has been married twice. She married singer Rocky Ferguson in 1987 and the two were divorced in 1993. On November 23, 1993, Erin wed Steven Fleischmann. She does not have any children. In April of this year, five plaintiffs, including Erin Moran and other members of the Happy Days cast, filed a multi-million breach of contract suit in Los Angeles Superior Court against the CBS network. The other plaintiffs were Anson Williams (Potsie Weber), Don Most (Ralph Malph), Marion Ross (Marion Cunningham) and the estate of Tom Bosley (Howard Cunningham) who passed away in October 2010. They claimed that CBS had failed to pay them for merchandising revenues under their contract. TV Banter readers have chosen June Cleaver (Barbara Billingsley) of Leave it to Beaver as their all time favourite television mother. June Cleaver received 35% of the vote. Harriet Nelson of The Adventures of Ozzie and Harriet finished second with 25% of the vote and Carol Brady (Florence Henderson) of The Brady Bunch Bunch finished third with 16% of the vote. Donna Stone (Donna Reed) of The Donna Reed Show received 4%. Margaret Anderson (Jane Wyatt) of Father Knows Best followed with 2% of the vote and Shirley Partridge (Shirley Jones) of The Partridge Family had 1%. There is a new poll about television comedies. Check it out. EDITOR'S UPDATE: (May 4, 2017): In July 2012, the Happy Days actors settled their lawsuit with CBS and received a payment of $65,000 each and a promise from the network to continue honouring the terms of their contract. On April 22, 2017, Erin Moran died in Indiana at the age of 56. The cause of her death was squamous cell carcinoma (skin cancer) of the throat.